I hinted in the last post that I’d been doing a lot of canning recently. 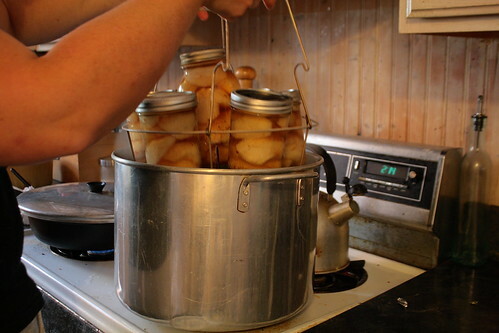 I grew up with canning, helping my mom put up all sorts of fruits and vegetables for our family’s winter eating. Sadly, I didn’t always appreciate the font of knowledge that was before me at the time. 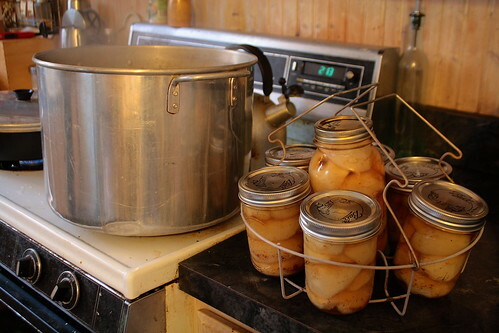 Nor did I really embrace canning again until last year. This autumn I’ve been a woman on a mission, intent on returning to the traditions of putting up plenty of jars to “keep on keepin’ on” with the local eating long after the garden is in its wintery bed. The recipe I’m giving you today isn’t exactly the one my mom uses because I like to add a few bits of warm spices to mine, but the concept is very much the same. 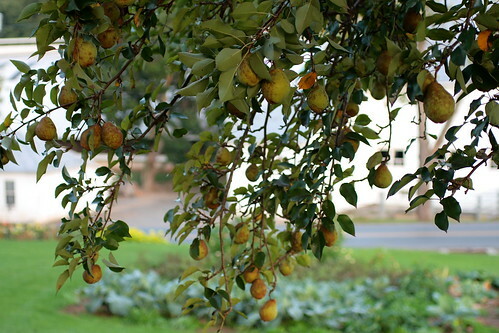 I used pears from the same tree in the side yard of our family farm that my grandmother used when she was my age. I also happen to use the same canning kettle and jar rack as my grandmother. She gave them to me at Christmas last year. I was extremely sad when she did, because it meant that she herself would never use them again (she’s 90 and unable to see well enough to can anymore) . Once I got started using the kettle though, I felt incredibly grateful to her and to my mom for passing down both the tools and know-how to preserve my own food. As I lifted the heavy jars full of ripe pears into the kettle to be processed, I couldn’t help but feel deeply connected to my family and its heritage as my hands were holding the same handles as my grandmother’s had so many times over so many years. What follows is a pictorial guide to canning pears with the recipe at the end. This same method can be used to can fresh peaches. Get ripe but still firm local pears. Do not use mushy fruit. Set yourself up with two chairs, a large dish pan, a large bowl and a sharp knife. You sit on the side of the dish pan. Put the whole pears into the dish pan, leaving a corner empty. 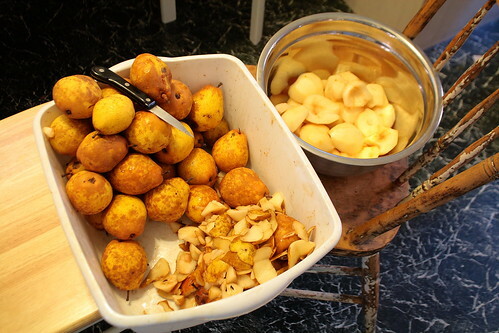 Peel and core pears, putting scraps in the empty corner of the dish pan and the clean pear halves into the big bowl. 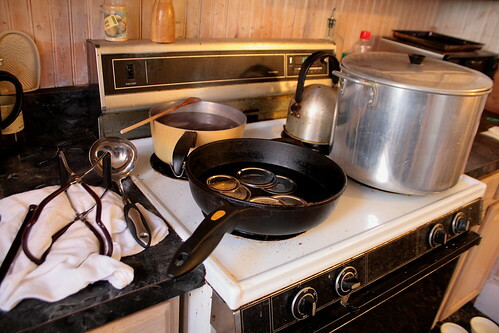 Set up your stove to work efficiently: one burner for simmering lids, one burner for the canning kettle, one burner for making your syrup, and one burner for keeping some extra water simmering in case you need to add it any of the other three. Keep ladle and jar lifter close at hand. 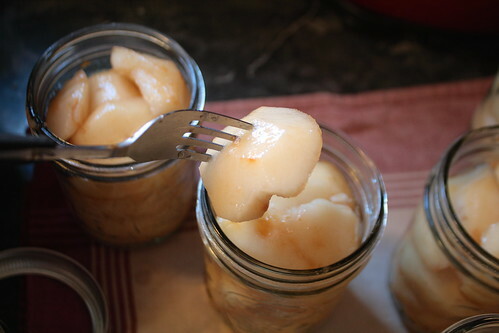 Pack sterilized jars with pear halves using a fork and keeping the round side up. Put one jar at a time in a bowl to catch spills and use a ladle to fill with hot syrup (l). Thoroughly clean rims of filled jars with a damp paper towel (r). 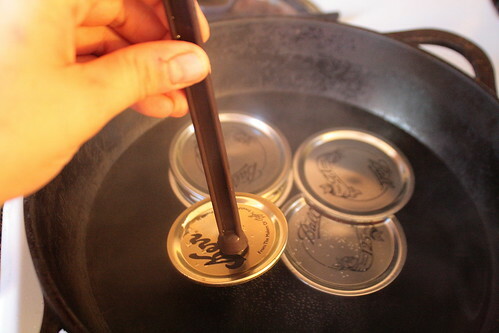 Use magnet or tongs to carefully lift hot lids out of simmering water and place immediately on jars. Fill rack with seven filled and capped jars. Temper jars by placing them half way into the hot kettle for 10 seconds and then lift them back out. Repeat. Finally carefully submerge completely and put lid on the kettle. 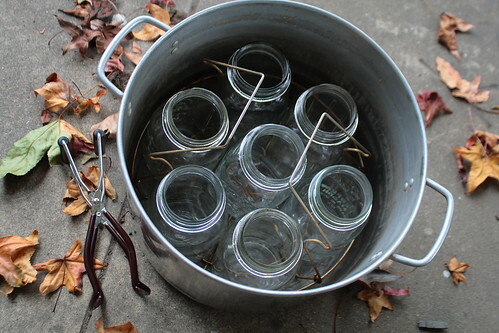 Begin by filling the canning kettle with water and placing 7 jars at a time in it, also filled with water. Place kettle on high heat to come to a boil while you prepare the pears. Place lids in a shallow skillet and cover with water. Set over low heat to simmer until ready to use. In a large saucepan, combine the sugar, water, cinnamon, nutmeg, and anise, stirring well to get the sugar to start dissolving. Leave the saucepan sit on the counter while you peel half the pears. When you’re about half way done with peeling, put the saucepan on high heat to come to a boil. If it starts boiling before you are done peeling, just lower the heat so it is simmering. Set up a peeling station with two large dish pans or bowls. Fill one with whole pears, leaving a small space at one side empty. Use a sharp paring knife to peel and core the pears, putting the peelings into the empty spot you left in the bowl/pan with the whole pears and placing the cleaned pear halves in the other bowl/pan. Work as quickly as you can and peel only as many pears as you’ll need to fill the 7 jars so that the prepared pears don’t sit around too long and discolor. Use the jar lifter to carefully lift the jars out of the boiling kettle. Leave the kettle on the stove to continue boiling with the lid on. Very carefully dump the hot water out of the jars and set them on a folded dish towel on the counter. Use a fork to spear each pear half with its rounded side facing up (the cavity facing down). Lower pear halves into each jar, packing them tightly and leaving at least a half inch of head space at the top of the jar. Take the hot syrup off the heat. 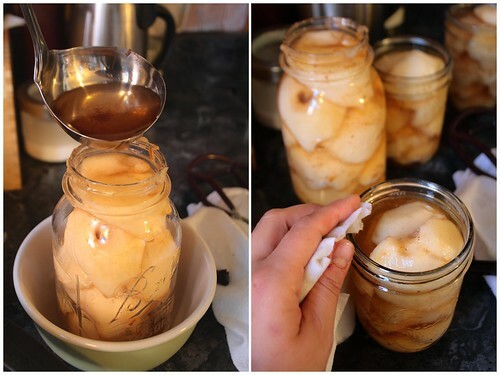 Place a jar of pears in a bowl to catch any spills and use the ladle to pour syrup into the jar, covering the pears. Repeat until all the jars have syrup. If you should find yourself running low on syrup, you can add about a half cup of hot water to the saucepan to make it stretch. Use a damp paper towel to carefully wipe the rim of each jar clean, running your finger over it after cleaning to be sure there are no residues or chips in the glass that will interfere with the seal. Using tongs or a magnetic wand, fish out one lid from the simmering skillet at a time and put on a jar and secure with a ring twisted on tightly. Repeat on all jars. When all jars are ready, place in jar rack/lifter and carefully lower half way into the boiling kettle and then pull them back out. This helps make sure the jars won’t crack at the sudden exposure to high heat. Repeat lowering-lifting again before placing the jars entirely in the kettle. Make sure the water covers the jars by at least an inch. If it doesn’t, top off the kettle with more boiling water from a tea kettle or the water the lids had been simmering in. Keep the kettle over high heat and process the jars for 20 minutes. Using the jar rack/lifter, carefully remove the jars from the kettle. Set on the folded dish towel, dabbing off any water that lingers on the lids. Place another towel over the jars and allow them to sit for at least 4-5 hours without being disturbed, ideally overnight. The lids should start popping (sealing) in an hour or two after coming out of the kettle, but don’t fret if a few haven’t as some take much longer to get a good seal. Test the seal when the jars are completely cool. If the lid is firm, it’s sealed. If it has a spring in it still, it hasn’t sealed and you’ll need to store that jar in the fridge. Use a permanent marker to label the jars and store in a cool dark place until ready to use. Properly sealed and processed jars can last over a year though it’s best to try to eat them before the next pear season comes around. Entry filed under: Preserves, Recipes. Tags: canning, cooking, food, recipe. Beautiful. Unfortunately, all I managed this year was a batch of strawberry jam, but there may yet be time for a few pints of applesauce! I was wondering about using vanilla bean instead of the cinnamon and star anise. I wonder if it would over power the pear. K – I think that would be lovely! I’d just use one bean for the whole batch of syrup/pears so it’s subtle. Wish I hadn’t put all mine in jars already, or else I’d try that. 🙂 Another good idea from you! Lovely blog! I’ll be adding you to my blogroll. I commend you for canning…we just recently got into canning at my house, and while it takes bit of effort it’s definitely worth it come winter time! Beautiful photos! 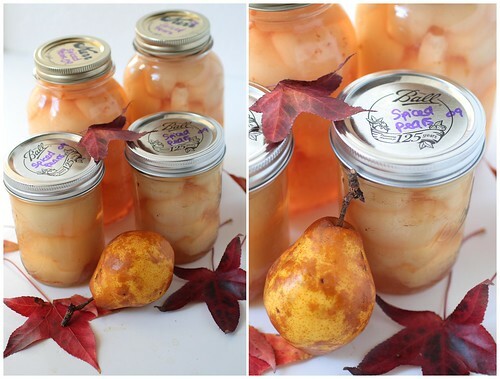 I have not tried canning pears, but will next year after seeing your post! I did green beans for the first time this year, and am amazed each time we serve them how wonderful they are! Thank for sharing you blog! We are canning fanatics! From the beginning of strawberry season to the end of apple season, we can just about everything we can go pick for ourselves. I love the freedom it gives you to use no preservatives, little to no sweeters, and to stock your pantry with local food and even rare varietals of certain fruits. We’ve somehow not tried pears, yet, though. Maybe next year! Wow, you are a comment fiend today, Jason! 🙂 Love it! It’s so nice to know there are kindred spirits out there that love local food and canning and gardening and writing and….well, everything, as much as I do! If you haven’t tried canned pears, you’re in for a real treat! And have you ever canned peaches? Oh my, if you haven’t, you must next summer! Same process as the pears. Oh, and I’ve got a recipe for canned pickled beets waiting in the wings too that you should certainly try if you don’t have your own already. 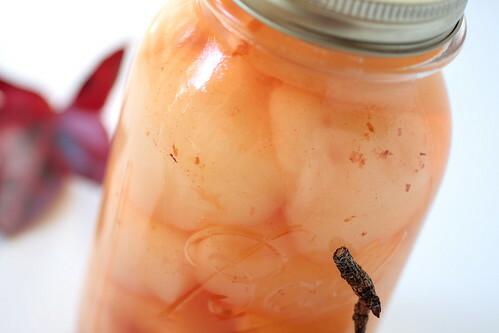 I agree… homemade canned peaches are the stuff of the good life. Personally, I find freezing them much easier for my own kitchen use, but my family back in Louisiana really appreciates my canning efforts. I try to send everyone at least two pint jars of Red Haven peaches that we u-pick at our favorite orchard in Michigan. Our haul, this year, was 128 pounds of pure peach ecstasy. It’s really hard to curb your enthusiasm when you’re surrounded by all those trees full of these perfect peaches. Our u-pick pilgrimages take us to Wisconsin and Michigan for strawberries, blueberries, raspberries, blackberries, cherries (sour, bing, and rainier), peaches, and apples. I don’t think I’ve bought frozen or canned fruit from the grocery store since 2006 when we first started our forays into this madness. I call it madness because once you’ve done it you can’t seem to bring yourself to stop even though nearly everyone else around you is baffled by your enthusiasm. Even with the imagery of the balcony, your blessing has an Irish lilt to it that I definitely appreciate. 😀 Happy holidays to you, too! I’ll be giving this pear recipe a try tomorrow – sounds delicious. My son is working in a pear packing shed this summer, so I have access to nearly unlimited free pears. Your story of your grandmother’s canning kettle brought tears to my eyes. It was beautiful. We bought a very old farm house for our early retirement. Began my first garden, now I canning. Oh my! What a rewarding, enjoyable life. Thank you for such easy and tasty recipes. Thanks so much for taking the time to post this. We are first timers, and just canned 10 lbs. of pears using this recipe. They are delicious; we are beyond excited, and planning to do another batch! I love when there are people to lead by example. I just received a box of pears from the local school fundraiser. 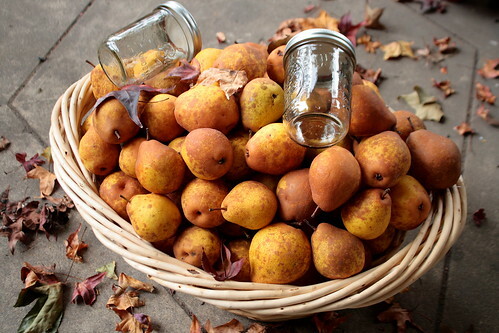 I am going to start canning pears for the very first time. I have only started canning this fall and I am a newbie to the process. I have heard that you should never cold pack pears. Do you have any idea why this would be? I am all ready to start my first batch, but am I hesitant. I found your blog while searching for a recipe for canned spiced pears. Thank you for the recipe you gave here. I received some beautiful pears from a friend and I can’t wait to get in the kitchen and try it out. I love your story about how your mother gave you her canning supplies and how that made you feel. It brought tears to my eyes thinking of my grandmother (92 yrs old) and the joy I get using some of the very same things she gave me when I can my harvest. The boiling water bath is going right now for the first batch of jars. I’m using pint and a half for these. It just the jars at hand at the moment. 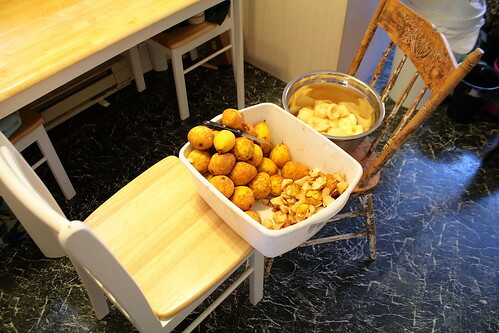 I just finished 21 lbs of pears! I didn’t have the star anise tho, so I substituted (on a double batch of syrup), 1 teaspoon of ginger, and 1 teaspoon of cardamom. BEST BATCH OF PEARS I’ve ever made!! Definitely going to make more! OMG!! !